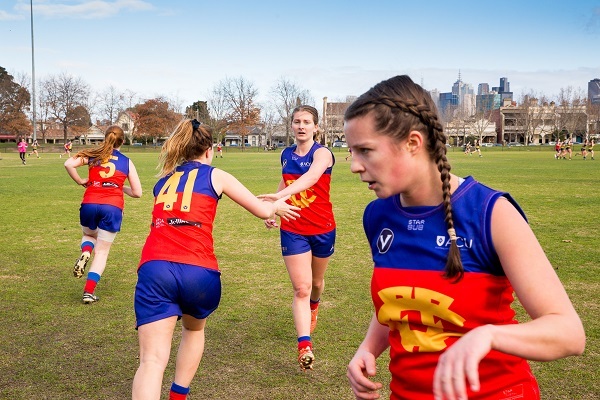 In her post match interview, Fitzroy-ACU Senior best on ground player Alice Batterton said it all “I remember our very first training session of the Roys four years ago on this ground and its so good to be back." 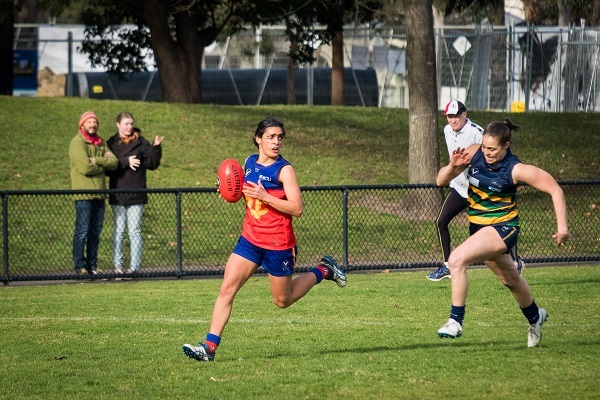 The Fitzroy-ACU sides took full advantage of a rare opportunity to play at Brunswick Street Oval on Saturday defeating SKOB Saints in the Seniors and Reserves. It was also the first time the Senior side had run out onto the ground to the Fitzroy Club song and the joy on their faces said it all. 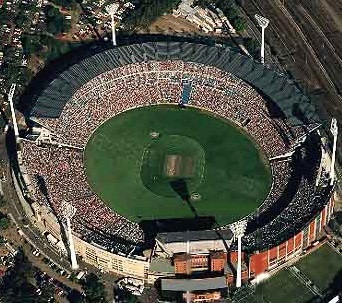 The fun soon turned to ‘ferocious footy’ as both coaches called for their teams to make the most of the game on the big ground. The Reserves are now all but certain of a finals berth for the first time in their three-year history, on the back of an outstanding display against St Kevin’s. The twos used the wind to great effect, scoring three goals in each of their quarters with the breeze, whilst holding their opposition scoreless. The final score was 6.9.45 to 0.0.0. Tiff Vassilacos scored three goals and Sarah Worthington, two. Worthington was also named best on ground, with Tess Plant-Thomas and Emily Fitt also standing out in what was a very strong team effort. 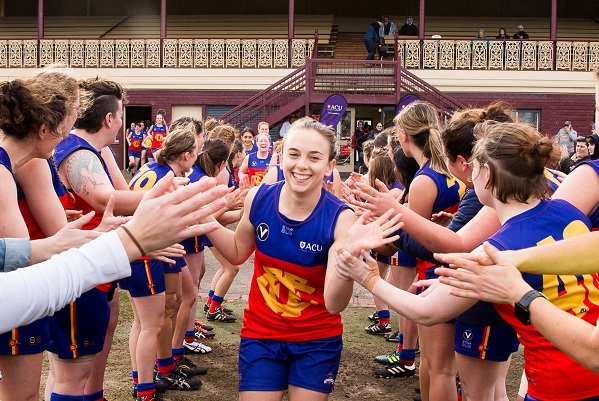 With three games to go in the Premier Women’s Reserves comp, the Roy Girls are three games clear and the main question now is can they finish third to score a home final? 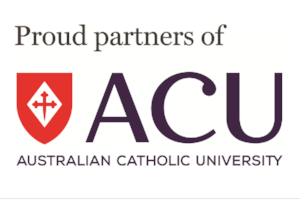 For the Senior Fitzroy-ACU team, the equation is a lot more difficult. They are in 5th position, 2 and a half games and percentage behind the top four. Everything would have to go right. 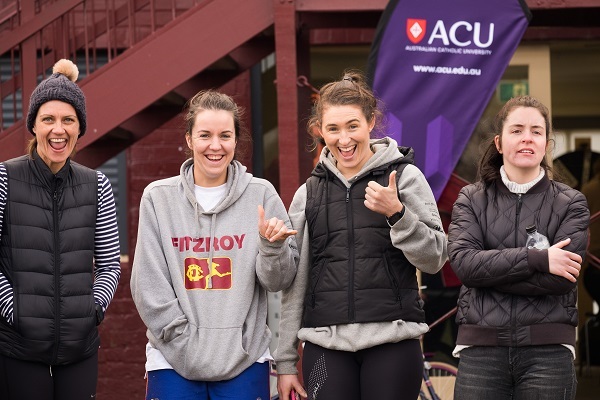 They were more than up for the challenge when they took the field on Saturday and turned on a scintillating display of footy, with Ruby McDermott, Hillary Collett and Liz Olney scoring some of the best goals you’ll see this year. Check out the Risk Care Roundup this week for some extended highlights. 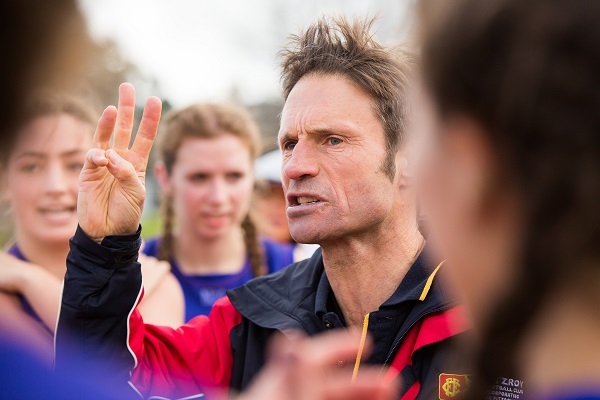 After the game coach Mick Symons praised a total team effort and noted it was hard to identify just one best player, with Erin Gogerly, McDermott, Collett, Lucy Kerr (despite her tag), Alex Monteiro, Emma Delany, Emma Craven and Alice Batterton all putting in strong performances. The key to the win was again the defensive effort against the wind and after quarter time, they didn’t let the Saints in for another goal. The final score was 6.5.41 to 2.6.18. The win was soured by season ending injuries to Ruby McDermott (dislocated patella) and Sam Hood (broken finger). Post-match, the Fitzroy-ACU sides were hosted by Fitzroy Victoria Bowling and Sports Club for their first ever post-match presentation with best on ground awards presented by both coaches, with the St Kevin’s coach noting it would be great to see all the women’s teams adopting the post-match model set by the men’s sides across the VAFA. Thank you to Peter Cassamento for the wonderful photographs. Some tough gut running and spectacular goals were the order of the day as Fitzroy fought back from five goals down at quarter time to defeat Marcellin at home and put a bit of a break on the competition for a top two spot in Premier C.
With the assistance of a strong breeze and the aid of St Kilda superstar Leigh Montagna, the Marcellin boys weren’t mucking around in the first quarter and raced away to a 7.3.45 to 2.1.13 lead. 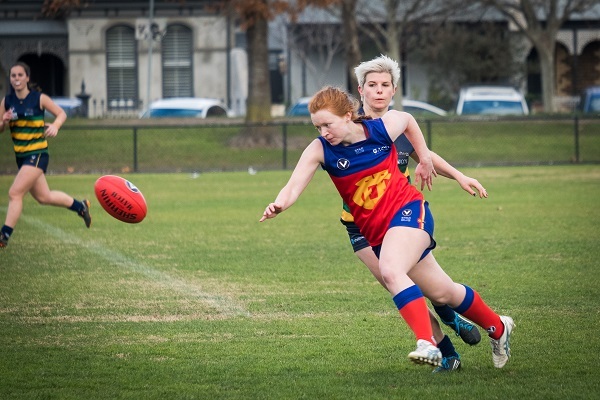 Taking their turn with the wind, Fitzroy soon made significant inroads into the gap, with a six goal second quarter narrowing the half-time margin to just 14 points. Ross Borland got Fitzroy up and running and an inspired Nathan Ligris snap soon had the Roy Boys up and about. 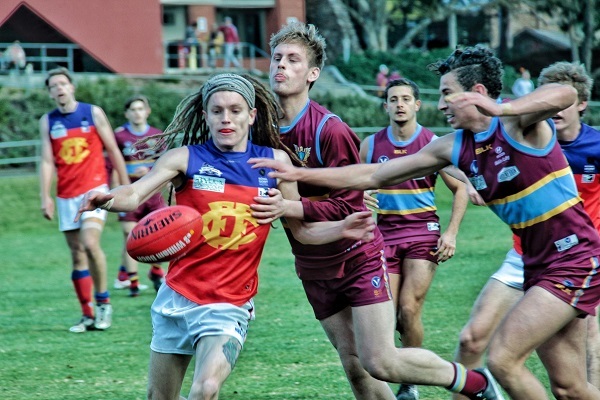 The defensive effort was brilliant in the second half as Fitzroy locked Marcellin down to just two points for the remainder of the game. Meanwhile at the other end, Matt Kyroussis, Borland, Tom Cheshire, Sunny Brazier and Jack Dalton all submitted their entries for goal of the year. Brazier and Jack Hart, who are TAC listed players, proved to be very handy inclusions for a depleted Fitzroy, with Sunny making the difference with four goals in a best on ground performance. Kyroussis was also outstanding, driving the ball forward and hitting targets time and again. The win gives the Fitzroy Seniors a very handy two game break on the rest of the competition, but there won’t be any relaxing. First game after the bye is back at home against old Premier B rival and bogey side, the Peninsula Pirates and despite their ladder position the last time the teams met it came down to the last kick of the day. The man in a rich vein of form, Sam Baker, will miss the next two games having been red carded in the final minutes of Saturday’s game for accidental high contact. Sometimes it just has to be done. It was a dour struggle for the Fitzroy Reserves at Marcellin, but they toughed it out determined not to lose their second game of the season. In freaky and often wet conditions, with goals hard to come by, the Ressies went on to win 6.4.40 to 4.8.32. Jimmy Miller was best on ground and kicked two of the goals. The Reserves continue to sit one game clear on the top of their ladder. It wasn’t such a good story for the Under 19s, who went down by 51 points to third-placed Old Carey. They are now 10 points out of the top 4 and will have to get their winning form back quickly if they want to see September action. Up front John Jorgensen and Rory Patterson continued to find the goals with four and three respectively. Check out some of the highlights of the Senior Men’s and Women’s games in the Risk Care Roundup. 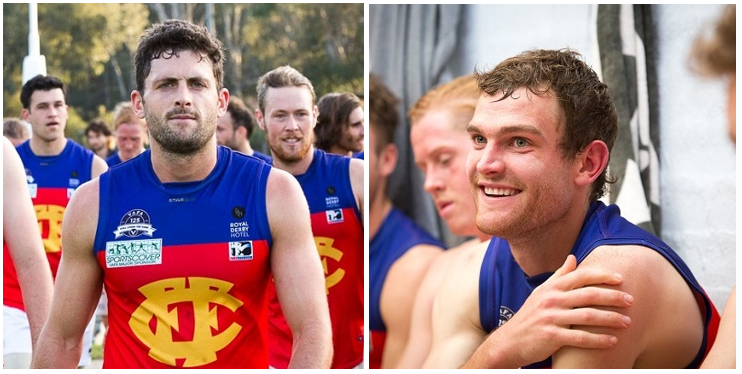 The Big V squads are in action this weekend and Fitzroy senior defenders Tom O’Donnell and Max Ellis have made the final cut for the Premier B-Division 4 team to take on the side from the Western Australia Amateur Football Association. 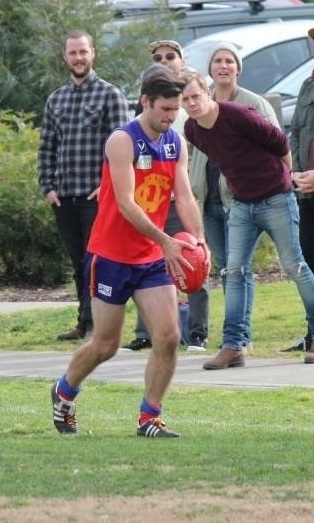 In fact, Fitzroy is the only team with two representatives in the Big V side. The teams will meet this Saturday at the Trevor Barker Oval in Sandringham. The game starts at 2pm if you’d like to get along and support the Big V.
Congratulations Tom and Max and best of luck tomorrow. 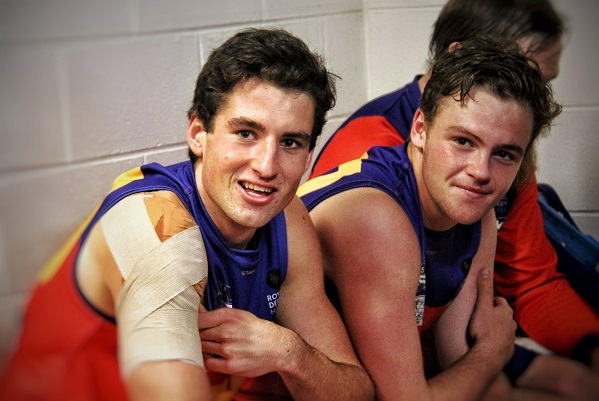 Ted Clayton and Nino Lazzaro were named in the final 30 for the VAFA Under 19 squad. 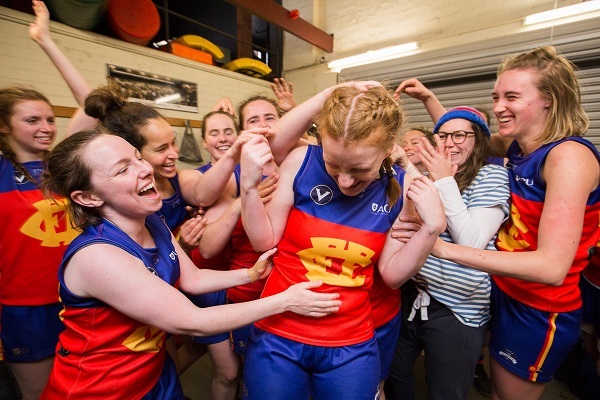 One club: It might be the bye week, but the Fitzroy coaches and teams took the opportunity to do something they love – train together as a club. 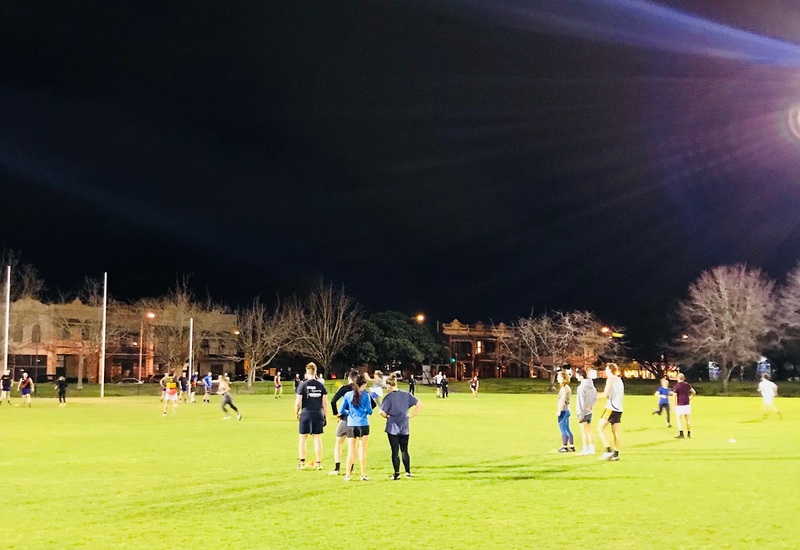 Following the session on Brunswick Street Oval, the teams headed to the home of sport in Fitzroy, our major sponsor, The Royal Derby, for dinner. The ABC's leading political commentator, Barrie Cassidy and the Member for Batman, Ged Kearney will headline this year's Reds Foundation Annual Political Lunch on Saturday 14 July at the Jellis Craig Game. Last year we focused on State issues, but this year we’ve gone Federal and this is likely to venture into all kinds of issues. Barrie and Ged are also big football fans so there’s sure to be plenty of footy talk too. Come along with your questions at the ready. The lunch will precede Fitzroy’s clash with the Peninsula Pirates. 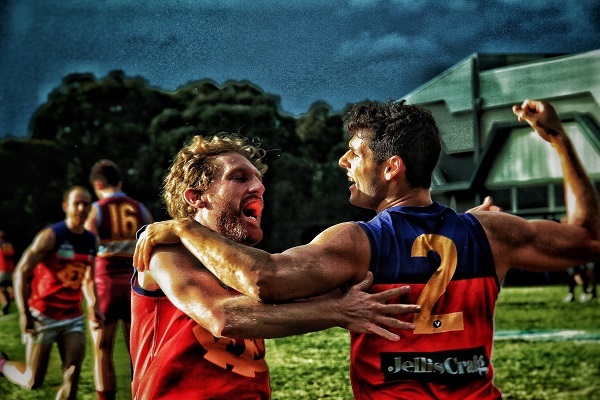 Six goals from captain Tim Denatris has helped the Fitzroy Thirds to an outstanding away win over third placed Old Trinity, boosting their chances of a top four finish. He had some pretty handy help from spearhead Simon Heather, who kicked four, as Fitzroy led out strongly to be up by 38 points at half time. Having scored 10.5 in the first half, Fitzroy was a little astray with 3.10 in the second. The lead was a bit too much for Old Trinity, who came home strongly but couldn’t bridge the gap. The final score was 13.15.93 to 11.9.75. For the second week, Trent Carpenter was best on ground with Harald Jorgensen and Hugh Morris-Dalton contributing strongly. Denatris also kicked a bag of seven last season. Let’s hope he and Heather can keep finding the goals as the team makes a run for their second finals’ series in succession. With four to play, they come up against the three sides immediately below them on the ladder and second placed Beaumaris. Coach Trent Coleman has the team up and about but the ladder is tight and there is still a lot of work to be done. Go Roys! Afternoon tea – cake bakers and eaters wanted! Bakers start your ovens! You will no go hungry at Brunswick Street Oval on Saturday 14 July. 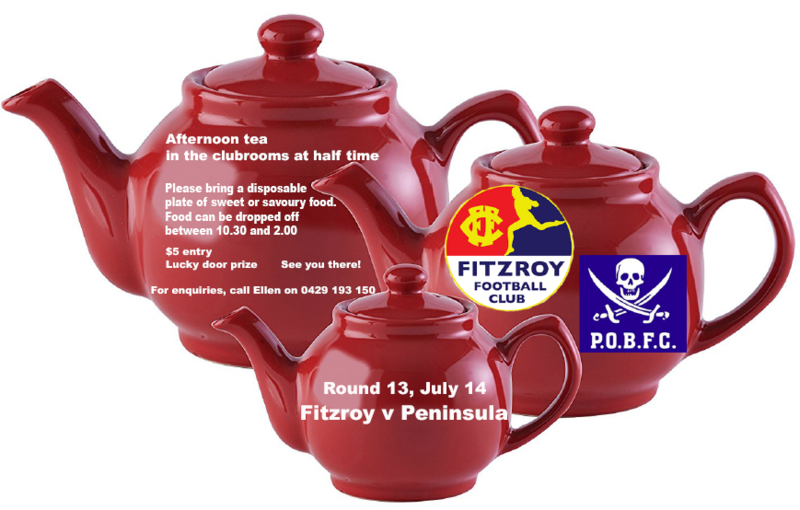 Aside from lunch and the most-talked about burgers in Melbourne (possibly the world), Ellen Makridis is organising Fitzroy’s annual afternoon tea for half time during the Seniors’ game against the Pirates. If you can bake a cake or make some other contribution please bring a disposable plate of sweet or savoury food (with details of all ingredients marked) and drop it off to the kitchen/bar in the community rooms between 10.30 and 2pm. If you’d like to eat the goodies, bring your $5 cash to the community rooms at half time on the 14th. Fitzroy’s annual raffle has gone on sale and with the full finals series tickets (courtesy of the Brisbane Lions) on offer and a selling price of just $5 a ticket, you’d better get in quickly. This weekend is a bye in the VAFA competition. Teams are back in action on 14 and 15 July.